While sitting waiting for someone in the museum offices yesterday, I picked up a copy of the Museums Journal (as you do. It just about beats staring at the walls) and it made for interesting reading. One article did, anyway. It listed the results of a phone poll of 3,600 people in London, who were asked how often they visited museums, and which areas of museums interested them most. Quite a few people said they had visited a museum in the last year, or would consider visiting one. Not too surprising (although I have a sneaking suspicion the figure might be inflated – if asked most people will probably say yes…nobody likes to be seen as uncultured! ), but it was the figures for ‘top areas of interest’ that interested me most. At the top of the list, with 82% of people showing an interest, was natural history. Next was ancient history, cultures and civilisation, local history, and then down in fifth (with 66% of people being interested) was famous artists. Which may not be fascinating to many people, but it intrigues me. One of my pet peeves with museums is the amount of money that gets invested in art galleries compared to other departments. I know that art galleries are important to museum directors because they bring in the most money – art collectors tend to be quite well-off, and they donate lots of money and lovely important works of art. So art galleries get a lot of investment because they are nice cash cows, while other departments remain neglected and understaffed because they bring in very little revenue. I have seen natural history departments left without a single curator to look after the collections because there is no money to replace staff, while at the same time the art sections of the same museums are expanded, and I’ve seen archaeology displays ripped out to make way for more modern art gallery space (contemporary art only got 47% in the London poll, while ancient history got 78%). These are the areas that really interest the general public, but they are being sidelined as art becomes more important in museums. It baffles me. Yes, art is important, and I know it makes money, but dinosaurs and stuffed animals and mummies are what children go to museums to see! And yes, I know I’m biased, because I am a natural historian and obviously I think my subject should be most important, but this seems to be a widespread trend in museums now. And more than anything I find it sad, because kids going to smaller museums these days will see fewer displays on the subjects that really interest them, and be able to learn less about the history of life and of different cultures and all the things that inspire kids to want to go see the world and do exciting things like dig up dinosaurs, or discover new species and lost civilisations, because some of the smaller museums may end up having to downsize their collections as the cost of their care becomes greater than the revenue they create. In the end museums are a business, and everything in business comes down to money. But most importantly, if natural history is dropped from museums I’ll be out of a job! I have visited a lot of museums, but I’ve only worked (well, worked for money!) in one. And so far it is very much living up to my expectations. I’ve always had a picture in my head of museum storerooms as being slightly musty, dusty repositories of ancient curios, with endless wooden drawers full of hidden treasures. And that’s pretty much what it is really like! Most of the stores are not actually all that dusty (though some of them are a little musty! ), and they’re incredibly well organised…in a slightly chaotic sort of way! Which is good, because it means that while the cataloguing and storing of objects by type, age, species, etc. means that you have a fairly good chance of being able to predict what’s coming up next, there are always surprises, anomalies that keep you on your toes and make the job extra interesting. Finding something you don’t expect is always an amusing diversion, especially when you find a femur that has been labelled as a lemur, or a kangaroo skull that somebody has identified as belonging to a pelican! But these things happen when you have volunteers (who are mostly enthusiastic members of the public with little formal training or education in the relevant subject areas) doing your documentation work for you…It’s great having people who are interested and want to do it for free (because most museums are permanently cash-strapped and can’t afford to actually hire the staff they desperately need), but it does occasionally lead to these sort of clerical errors because the volunteers don’t have the specialist vocabulary required (although a little common sense would have helped in the case of the femur/lemur! And the kangaroo/pelican. I mean, the snout still had some mummified flesh clinging to it, complete with whiskers! It must have been a rare whiskered pelican…). Not that I’m knocking volunteerism – I did it for two years because volunteering is the only way to get the experience that museums want in their curators. It is something of a catch-22 situation…museums want people with experience, but the only way to get the experience is to work in a museum. So a lot of people end up doing it for free. Like me. And I enjoyed it, and it got me my current job. It took me a while (in the current climate finding a job in any industry is hard!) but I got there in the end. And I’m very glad I did. For a while after I got my job I kept thinking “I can’t believe I’m getting paid for this!”. I’ve just about gotten over that now, but it does still strike me sometimes just how lucky I am to have a job that I love (especially when I hear other people bitching about their jobs!). I did this for free for two years, and now somebody wants to pay me to do it. That’s amazing. I thought that the art gallery would be one of the easiest sections of our cataloguing work within the museum. Apparently I was wrong. Due to various issues (involving huge boxes in very narrow aisles stored well above head height and accessible only with a worryingly wobbly ladder) it has turned out to be one of the most problematical areas. I thought that my main issue in the art gallery would be my complete lack of knowledge about art (seriously – I had no idea who Mackintosh was. I now know very well, having catalogued a very large amount of sketches, prints, paintings, wall hangings, wood panels, chairs, wardrobes, stained glass windows, meat safes…CRM was a very prolific man! And very unchoosy in his work. He would do anything. I’ve seen designs for carpets, furniture, houses, tombstones…you name it, he would design it for you!). But it turns out that the main issue is just how much paper can weigh! Some of the boxes of prints weigh more than you would think humanly possible, considering that they basically contain PAPER! There are some boxes that even two of us can’t move at all. Which is frustrating, because I want to see everything! Every day is like Christmas, opening up the boxes to see what goodies are inside! Even if it is just yet more Turner prints (they’re beautiful, but there are a lot of them!). I know nothing about art because I’ve never taken much of an interest in art. This is largely due to the fact that I find art galleries boring. And THIS is largely due to the fact that art galleries don’t tell you what you need to know…you look at a painting, and next to it will be a panel giving you the artist’s name, the title of the work, the techniques used, the artist’s influences, etc…but they don’t tell you WHAT IT IS YOU’RE LOOKING AT! Which in some cases is easy enough to fathom – a painting of a bloke plowing a field is a painting of a bloke plowing a field (and is probably also entitled ‘A Bloke Plowing A Field’, or something equally unimaginative). But often it can be a painting of (for example) some obscure bible story, and unless you’ve read the bible cover to cover you have no clue what it is you’re looking at. And they don’t actually GIVE you a clue. A brief description of the subject matter would do, but no, obviously too difficult. Which is why I have a very short attention span when it comes to art galleries. I’ve been working in the Zoology Department for a couple of weeks now. I started with their store of wet-preserved specimens (i.e. things in jars. Pickled, dead things). And I got to see a lot of amazing species, many of which you don’t normally get to see outside of wildlife documentaries. Some of them were quite gross (sea slugs, for example, look much cuter in text books (if they can ever be described as ‘cute’! )), but others were quite beautiful (some of the sea jellies (you’re not supposed to call them jellyfish any more) were stunning, and the little golden mole was adorable!). And some of them were just completely, nauseatingly, disgusting (such as the 240cm long tapeworm, removed from the bowels of a third-year zoology student in 1979. I do, however, love that they included these details on the label!). And then there were the oddities…the sort of things you only see in a certain type of wildlife documentary (such as Nick Baker’s Weird Creatures). The freaks of the animal kingdom. Like the Australian Thorny Devil (which has the wonderful latin name of Moloch horridus), the Olm (a blind cave-dwelling amphibian with tiny vestigial legs and external gills), and the Surinam Toad…possibly the most disgusting (yet fascinating) thing that we found. And for this reason: once fertilised, female surinam toads carry their eggs on their back, and their skin swells to cover the eggs, embedding them in a sort of fleshy honeycomb. When fully developed, the baby frogs then burst out from beneath her skin, much like something out of Alien. Unfortunately for these babies, this was the exact moment that they and their mother all got dunked in a vat of formalin. Which makes for a quite macabre spectacle. It has a strange, sort of “car crash zoology” effect…you know it’s horrible, but somehow you can’t quite tear your eyes away from it. Except for the few that’re still creepy, horrible, get-it-away-from-me-now! Most of the beetle collection is fascinating, however. Wonderfully exotic colours and shapes. Some of them look like they’ve been painted with a tiny little brush! Or a much larger brush, in the case of the Hercules beetle, which looks like it could swallow a cat if it was so inclined! There are beetles that look like spiders, like bees, leaves, thorns, and even frogs! And some quite remarkable beetles that are able to synthesise opal to form part of their wing-cases! And jewel beetles, which don’t really look much like jewels, but are beautiful nonetheless. And are actually used to make jewellery! Whole beetles, set in gold and made into earrings and brooches! A classy look, I think we can all agree. Although I suppose it’s not so different from the pyritised ammonite that I have on a necklace, so I can’t really comment. The most stunningly beautiful things that I have seen so far on my store room rummagings, however, have to be the butterflies. Some of them are so fragile and delicate that they don’t look like they should be able to fly! And they have the most amazing, vibrant colours and patterns. And they’re all so different! Except the ones that are the same…There are some butterfly species that are the most convincing mimics of other species that you can barely tell them apart. Some harmless species copy the warning colourations of other, unpleasant-tasting, species, which improves their chances of survival beacuse predators will learn through eating the toxic ones that butterflies with that particular colouration aren’t good to eat. And sometimes two or more toxic species will develop the same patterning, benefiting them all by deterring predators. Although the picture doesn’t really do it justice. 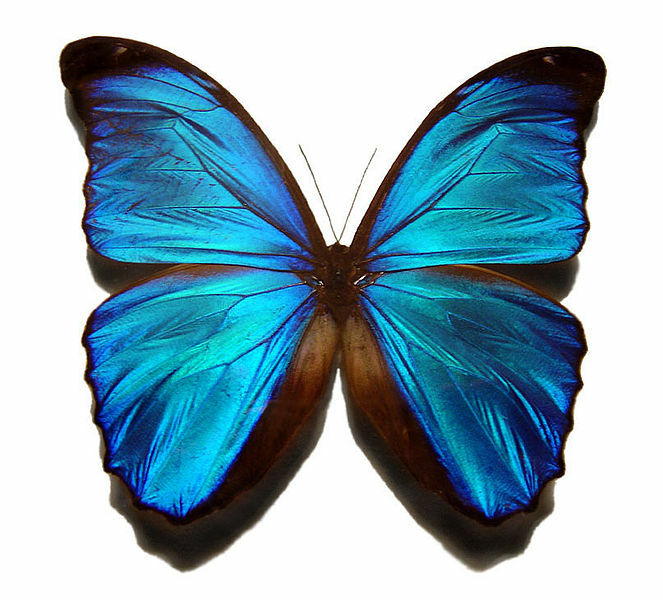 There are lost of species of Morpho, in different shapes and hues. The most amazing are the ones that look boring and white until you hold them up to the light, and then they irridesce green/blue/purple/pink. But I couldn’t find a good enough picture of one, so you’ll just have to use your imaginations! Firstly, that minerals all have BRILLIANT names. And that mineralogists have no sense of humour. Otherwise they’d have come up with rather less (one suspects unintentionally) hilarious names for their rocks! Proving perhaps not that biologists have a sense of humour, but at least that they think they do. And they certainly have a lot more imagination! Hello there! Welcome to my blog. Those of you who have seen my Facebook page will already be familiar with the following few posts – apologies for re-using old material, but I’m not a machine, dammit! I will be adding new posts as and when I find something interesting to write about…it may not be very regular (I’m a busy woman! ), but I’ll try to make it worth the wait!